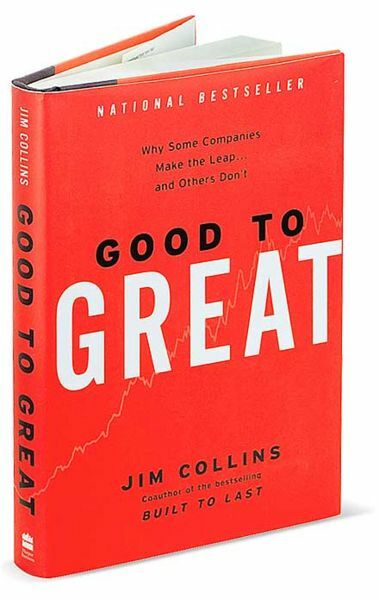 I’m nearing the end of the book Good to Great by Jim Collins this weekend. It’s a fantastic business book, particularly for those of you who have a future in leadership. There are tons of good lessons to be shared from the book, but I want to focus in on a small section in the book about ‘hardiness’. Hardiness is analogous to toughness and in this context is focused on how you recover from a negative event in your life. The excerpt below sums up key point. Throughout our research, we were continually reminded of the “hardiness” research studies done by the International Committee for the Study of Victimization. These studies looked at people who had suffered serious adversity – cancer patients, prisoners of war, accident victims, and so forth – and survived. They found that people fell generally into three categories: those who were permanently dispirited by the event, those who got their life back to normal, and those who used the experience as a defining event that made them stronger. The good-to-great companies were like those in the third group, with the “hardiness factor”. That is so insightful. I wish I had written it myself. How we deal with adversity is a key factor in the amount of success that we’re able to achieve but also in our happiness and self-worth. Most of us will never be a prisoner of war or suffer from a deadly disease but this reaction to adversity is applicable in both large and small things. All of us will lose loved ones. All of us will struggle with our work or our boss or our finances. None of us will live easy lives. In fact, even those people who are born with a silver spoon in their mouth think life is hard. How much more harder is it for those of us who have to work hard for everything that we have? Each day, each week, each month and each year you will experience adversity, you will feel like something didn’t go right and it will frustrate you. How will you handle it? As I ask that question it strikes me that we’ll all handle each individual circumstance differently. We are not perfect. Sometimes it will just be too much and we’ll feel overwhelmed. When the fog clears we’ll realize that we gave in to the adversity, we lost our fight and became resigned. There’s no shame it that. All of us have been there. What’s important though is to know that it doesn’t have to be that way. Every one of us is programmed to succeed. We’re hardwired to overcome adversity. I think the categories below serve as a great framework, a strong reminder that helps us to look at our reactions and behaviors in the mirror and see whether or not we are living the way that we want to be living. I like short simple titles, so I’ll call the first category Resignation. This describes our behavior when we run up against adversity and give in because it’s just too much. We’ve all struggled and I’m not going to pretend it’s easy. It hurts to fail and it’s hard to keep trying. This category reminds me of one of my favorite quotes – “The mass of men lead lives of quiet desperation”. Henry David Thoreau wrote that to describe the resignation that he observed in people. He saw that the men and women who were born to be successful had been beaten down by life and by society. It was easier for them to give up and accept the fact that life wasn’t going to get any better. These people live life in a way that indicates a belief that the best they can hope for is a little luck from time to time and hopefully not too much suffering before they die. What kind of life is that? Sheesh. This is exactly where we find ourselves when we’re throwing a little pity party. Oh woe is me, boo hoo hoo. Now here’s the thing, when we get past the original emotion we’re going to have a choice to make. Do we develop a set of excuses that explain why we will never be successful so that we can live our own life of quiet desperation? I say NO! Life is too short and too precious to spend it making excuses for why we have to live like a loser. No one wants that. We have to stand up and fight back. The second category mentioned are people who get their lives back to normal after the adverse event. Frankly, this is good enough for most people. If you are able to go through something very difficult or debilitating and come out of the other end unaffected then you have accomplished something very impressive. You are like a windshield struck by a rock without cracking. You didn’t shatter and you don’t need to be fixed or replaced. You stayed firm and continue into the future without impact. There is a great measure of strength in the ability to do this. I don’t want to undersell the victory in this ability. That’s where the concept of the book comes plays a role. The book is titled Good to Great. It’s about maximizing your potential as a company and as a person over a long period of time. It’s not about going from Broken to Great or Beaten Down to Great. The person who is able to return to the status quo has done a good job. But the person who is able to use it to strengthen them and to push them past their original limits has done a great job. The study referenced in the book says that the people who excel are those who “used the experience as a defining event that made them stronger”. This is what being great is really about. No one is immune to adversity. We all face it; we all deal with challenges and struggles. What are you going to do about it? Around 6 years ago I moved into a job as an analyst in a relatively new area. After I got to the area I looked around and realized that there were no other analysts. In fact, there were no managers who had any idea how to do what I needed to do. It’s very unnerving the first time you realize you’re operating without a safety net. At that point in my career I knew that I had been doing some very good work, but I was always a person who was following instructions. Instructions breed confidence. You know that if you make a mistake or need help that the person who generated the instructions will be able to help you. Now, please don’t think that I’m comparing this situation to someone having a horrible accident or being a prisoner of war, but this is the type of adversity that strikes us in everyday life. I didn’t have instructions beyond ‘do what you think is best’. I was nervous about taking chances and looking stupid, but at the same time I was able to see the opportunity. It seems that most adversities come with opportunities. If I was willing to be bold, to try new things and have the courage to risk failure then I had to potential to achieve great things. I took my chance. I could have been lazy and done very little work, nobody around there would have known any better. I could have built the same old things that I had done in my other areas and supported the status quo. In fact, that’s where I started in order to establish a workable framework, but I didn’t stop there. I began establishing and analyzing individual and team metrics to identify the root cause of what we were seeing. I worked to minimize external factors that were creating noise in the data and I worked face to face with the staff to explain what I was doing, what conclusions I could draw from it and how they could change their process and behavior to make sure the stats that I was using would paint them in the best light. This 6 month period is easily the most important of my career. Internally it taught me the value of trusting myself and of taking chances. Externally it showed my leadership that I was management material and that they could trust me with additional responsibility. The lessons learned from this period have shaped my career and will continue to shape it moving into the future. This only happened because I did not sit back and resign myself to what life handed me. It only happened because I didn’t accept the status quo as being good enough. It happened because I wanted to be GREAT and because I used the opportunities presented by my adversity to try and get there. I hope that this has been helpful to you. I want very much for the readers of this blog to be overcomers. I pray that each of you live the best life possible and get the most out of it. God bless you as we move into 2012. This is our year! Posted on December 31, 2011, in Personal Development and tagged accident victims, Adverse event, Adversity, Good to Great, James C. Collins, jim collins, Khan, prisoners of war, victimization. Bookmark the permalink. 1 Comment.